This year Jason Clarke will face a revolution of simians in Dawn of the Planet of the Apes, but next year he'll be facing the elements in Everest, a mountain climbing drama from Baltasar Kormakur (Contraband). Now we have the first look at the film which will be presented in 3D when it hits theaters in February of 2015. There's no sight of the rest of the impressive cast, which also includes Josh Brolin, John Hawkes and Jake Gyllenhaal (sadly no sign of John Jacob Jingleheimer Schmidt). With a script from Simon Beaufoy, we're anxious to see how this cold and dangerous expedition turns out. Look below! 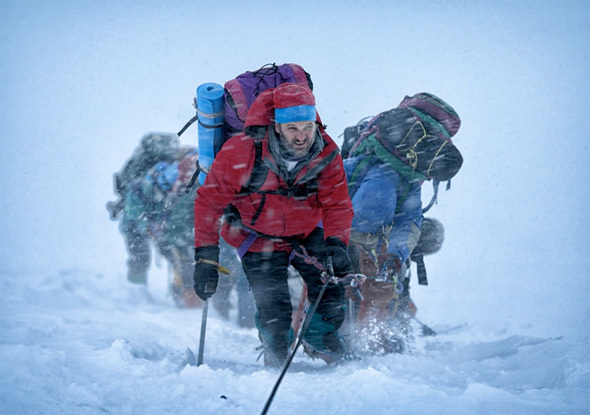 Everest is directed by Baltasar Kormakur (Contraband) and written by Mark Medoff (Children of a Lesser God) and Simon Beaufoy (Slumdog Millionaire, 127 Hours). The film follows a treacherous attempt to reach the summit of the world’s highest mountain, documenting the awe-inspiring journey of two different expeditions challenged beyond their limits by one of the fiercest snowstorms ever encountered by mankind. The climbers (Jason Clarke, Josh Brolin, Jake Gyllenhaal & John Hawkes) face nearly impossible obstacles as a lifelong obsession becomes a struggle for survival. Universal releases the film February 27th, 2015. Anyone who wants to climb Everest or K2 is simultaneously brave and dumb.